We all have disastrous hair stories. Here's how to avoid them. I've had a lot of bad cuts in my time - probably a history no different from that of anyone with curly hair, who's lived though mushrooms and blunt layers and strange volume. That's what hats are for. My real horror story had to do with color. Now, I don't normally color my hair, which was dirty-blonde and is now what the French call chatain and here they call "ash." Or maybe "mousy." When I was 23, a friend asked if I wanted to be part of a makeover story for a start-up magazine; they needed someone to go blonde. Sure, why not? I thought. At the time I was out of work and had nothing but time on my hands, so I hied myself to some Soho loft space and put on a dun-colored shirt for the obligatory unflattering "before" picture. The first inkling of unease came when they broke it to us that, in fact, the story focused on the use of some new at-home haircolor. Even though a salon would apply it, this was not what I had signed on for. Nevertheless, I duly submitted to an hour under the foils and dryer, Cosmo in hand and with the promise of imminent, having-more-fun glamour. And then, the reveal. I had known from the concerned murmurings of the technicians and the fact that I'd had some "second process" applied that there were concerns. But nothing - nothing - had prepared me for what I saw in that mirror. My hair was the color of Velveeta. Not cool, deliberate, Rayanne Graf punky-yellow, either. Just an obviously poor at-home haircolor choice that belonged on a hospital wall and drained my complexion to the color of a 19th Century wax doll's. I burst into tears. "It's not my fault," said the haughty Italian stylist who'd superintended. "Her hair was too dark; she wasn't emotionally prepared." Nevertheless, he attempted some third corrective treatment, at the end of which my hair looked just as bad but was completely fried into the bargain. The guy reluctantly offered to "correct" it "since I had such a problem with it" when it was less damaged. Thanks. All this would have been bad enough, but two days later, two days in which I made the intimate acquaintance of the sort of nylon turban that, at that time, had not yet been reclaimed by Prada and were the sole domain of old ladies, I got a call for a job interview. It was a good job, a job I wanted. And I had velveeta hair. I called a very expensive New York salon and scheduled an appointment. I'd have to stay blond, said the stylist, but she could make it look "more flattering." For the first three months at that job, I had platinum blond hair. And did not have appreciably more fun while I was at it. As soon as was decently possible, I had it colored brown. And since, it's remained virtually untouched. Choosing a Stylist: Maybe you're new in town. Maybe your scissor sister left to have a baby, or go back to school. Maybe she was promoted out of your pay grade. Maybe you just want a change. So, how to find someone new? If you like the salon, it's worth finding out if there might be someone else there. This can be awkward if the old stylist is still in situ, but chances are she'll understand if it's a question of money. Ask, ask, ask. I am shameless about stopping strangers and asking them about their hair. Once you convince them you're not one of those people shilling for a salon package deal, they're almost always flattered. Sometimes a little weirded out, but when you have hair that needs special attention (see: curls, length, black hair, short hair...) and you see someone who has it down, you can't let this stop you. This is, in fact, how I found my current stylist. Friends, of course, are a no-brainer: they can also tell you about vibe, about whether someone's chatty or businesslike, whether she likes the house products, booking policy and all that fun stuff. There's always the Internet. While I tend to take Yelp with a grain of salt, when you already have a place in mind, user-generated review sites like this can be an invaluable way to learn about specific stylists, hear the occasional horror story or make contact with someone with similar hair and pick their brains further. If you have the time, do a walk-by. See if you like the place's aesthetic, if it looks clean and pleasant and if you like the music and the products on display. You want to be comfortable. If you're really committed, go to an appointment with a friend and observe. 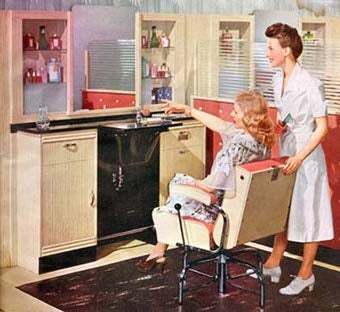 One person's ideal salon is not another's. When you make an appointment somewhere that looks good, if you don't have a specific person in mind, then be sure to tell the receptionist what kind of hair you have and exactly what you want. If you have a friend who cuts hair, either professionally or not, think hard before committing. In some ways, you have less authority in this situation. I was suprised when a stylist friend told me that she's had a lot of bad free cuts...and didn't feel she could say something. That said, a competent friend with a good aesthetic can be a lifesaver during the lean years. For a while I swapped cooking lessons with a friend who did my bangs; it was great until she left town. On Cheating: It can be hard to "cheat" on a longtime stylist, but sometimes you just need a change. If you end up going back, a little explanation - poverty, out of town, etc. - isn't out of order, although certainly not required! Most stylists are professionals and won't hold it against you. Cancel well in advance, if you have to. Just good manners, and gives them a chance to reorder their schedules. Get there a little early, say 15 minutes. You may get lucky, and at worst you've been considerate. If you're running late, give a call. Try to walk into the salon with your everyday style, so they can get a sense of your aesthetic. Yes, bring a picture if you have inspiration in mind. I know it can feel dorky, but stylists love to have a concrete guide. Keep in mind that what you like may not work for your hair, coloring or face-shape, though, so be flexible. I recently brought a picture of Regina Spektor's bangs in and, while I felt a little silly and Basic Instinct, I did get exactly what I wanted! Give it time. Don't schedule something for an hour after the appointment time; you don't want anyone rushing! A good rule of thumb is 20%, more if you feel like it. If you aren't happy, maybe less - but I'd say only if you're going to explain why, or you just look cheap. Tip assistants between $5 and $10: they don't make a ton, and they have washed/blown out your do! Even if an assistant seems to do most of the work, it's still good form to tip the senior stylist who's superintending. Yes, even if your stylist is the salon owner, he or she can use the tips. You should never feel uncomfortable. This is a service you're paying for. Most people want guidance. Keep this in mind. And everyone wants a good result: your hair is the stylist's calling-card, and word-of-mouth is invaluable for salons. You're allies! As mentioned above, some people are chattier than others. Don't feel pressured to talk if this isn't you. Or to feel intimidated into silence. And if you don't jibe in this regard, maybe you need to keep looking: again, comfort is all. Know what you want. Even if you don't have an image in mind or hand - and try to! - know whether you want a trim or something more dramatic. That said, listen up. If a stylist insinuates something wouldn't be the most flattering, at least hear her out: they know hair, and face shapes. You're here for the skill and the expertise, after all. Don't surrender complete control - unless you want to. Saying "I'm not sure I'm ready for that big a change," or "can you show me an example?" are tactful ways of countering someone going rogue. If things aren't going the way you want, speak up! A stylist would much rather know than have you burst into tears at the end of leave in silence and post a furious review online. It may not always be fixable, but at least you'll have tried. Don't worry about hurting someone's feelings: this is her job, and in any case, you'll be polite...right? What to Say if You Hate It: Anna touched on this last week: it's a hard one. First of all, before freaking out, give it a moment to sink in. Your impulse may be to mouth a platitude and get out as fast as possible, but there's nothing wrong with saying, "wow, that's a little more ____ than what I was expecting!" or "It might take me a little while to get used to this." If you come back for a correction, you'll have laid the groundwork. NO "FIXING!" As a stylist friend of mine once said, a good salon makes you feel good about your natural hair; if anyone makes negative comments - about your hair's condition, or color, or texture, or talks about "fixing" anything - that's a red flag. You don't need fixing; just celebrating. A correction. Be it color or cut, if it's awful, you're entitled to a free correction. Don't feel uncomfortable or guilty. Just say you've tried and it's not working. Please note, though, that if you were given the exact cut or color you wanted and just find you don't like it, that's your problem. Think of it as wine-tasting: you're tasting to see if it's off, not whether you like it. And yes, it's still good to tip on a correction. Bang trims. Most places will offer this gratis, and know that if they don't, it's unusual. Still, look into the policy before booking the trim. Blowouts. Most salons will blow out your hair for free after a cut, but again, if you're counting on it, check in advance. And some curly salons are dogmatically opposed to this, NB. Tell them your hair history. A colorist needs to know what shape your hair's in, how it's been processed, what your natural shade is. If you've had breakage in the past from color, he or she needs that info. If possible, try to get the same person to cut and color your hair. They know you, and they know your hair. If the salon doesn't work this way, then stick to one spot at least so that stylist and colorist can confer. Again, think pictures. And one stylist I know swears by baby pictures when women want to go blond because "the color you had as a kid will work with your skin-tone and look more natural." Know the terms. Learn about processing, foils, partials, demi-permanent and permanent, glazes, hilight and lowlights. And don't be embarrassed to ask questions if you hear a term you don't understand. Ask about maintenance, and be honest and realistic about your budget. They can also tell you how best to maintain the color. Corrective color may take longer, since it can involve removing the old color. Budget your time accordingly. Most of all, don't let this be a source of stress. As "they" always say, a good haircut is your best accessory, but a bad one is just that: a bad haircut. Hair grows. Unlikely trends are set. And there are always turbans.